Saloca in Wonderland: Walt Disney World - Packing Essentials! 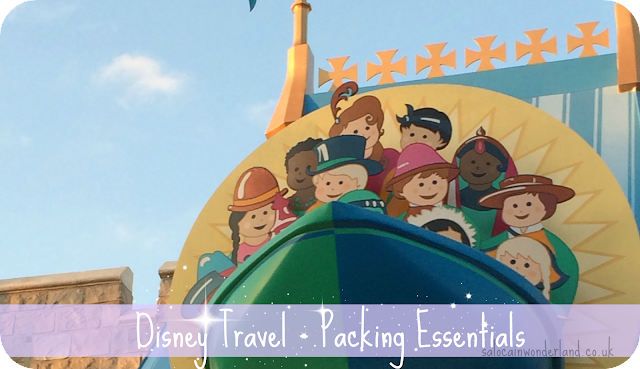 Walt Disney World - Packing Essentials! I’m not going to lie, as I type this, the suitcases are behind me and in seven days I will be up up and away on my grand magical adventure! Seven days. SEVEN. Lately, everything is just flying by! The bags are almost packed, the money has been changed, the tickets are almost booked and I’m pretty much just counting down the hours until I’m back in my happy place. You’d think I was excited or something! So, having packed the cases (mostly) I figured I could share some of my must have Walt Disney World travel essentials because hey, it’s not like I need an excuse to talk Disney to you or anything haha! Though I’m centring this post around Walt Disney World travel, these essentials would pretty much be good to go for any upcoming trip you’ve got, but the more magical the better if you ask me! Extra memory - I’ve upped my SD card size in my camera, cleared my phone to almost factory settings and have packed a spare SD card just in case too. I get super snap happy whenever I go away, but even more so on a Disney trip! I don’t want to have to worry about trying to rapidly delete pictures to make more room to take new ones, so some extra memory was the easiest option. Extra charge - I’ve mentioned it a million times, but my portable charger for my phone and camera has been a lifesaver since the day I bought it, so it will be journeying across the Atlantic with me. I can’t think of anything worse than being out and about in the parks and having to fret about charging up! Less is more - I always travel with a next to empty suitcase as I just love my shopping out in the states! I’ve got my shorts, my tees, my bikini and my flip flops, and that's about it! I plan on starting my Christmas shopping out there this year so I’m going to need plenty of room to bring back all those goodies as well as a couple of treats for myself! Costumes - OK this is probably more Disney related than regular travel related but we are hitting up the Halloween night at the Magic Kingdom during our trip and how could I not dress up? It’s not often the adults get to dress up around Disney so I’m not going to let the opportunity pass me by! I’ve done it once before and it was so much fun! Laundry Bag - boring! but essential! Like I said, I don’t take a lot of clothes so I will do a couple of trips to the laundry room over the trip. It just means I can pack less - bring back more! More often than not I jump in the pool every night, so throwing a load of washing in whilst I go for a swim is no biggie! Extra snacks - yes, I will buy a ton of food out there, but I usually take along some mini cereals, cereal bars, sweets, that kind of thing. They're super handy to have in the room, especially if I just want to grab something quick before heading out to the park, it saves me a little $$$ that I can spend on other things, and they make for great, cheap, park snacks too. Sunscreen for the face - I always take a separate sunscreen for my face as regular sunscreen just does not agree with my face! I’ve been playing around with a couple of samples and think I’ve found the right one for this trip! Watch this space! Food bags - you know those little plastic bags you split your meats into, or save leftovers in? That kinda of thing? I always take a couple of the resealable ones out with me for a couple of reasons. They great for keeping snacks in, and even better for grouping together certain things in my park bag for easy access and pulling out. They’re also ideal for storing frozen towels in for those really hot days, making great little ice pack style devices. You just know I learnt about this off Pinterest don’t you? Water Bottle - I always take a reusable water bottle with me, it saves me an absolute fortune in the parks, it's ridiculous how much they can charge for water! You can get water throughout the park from fountains and ice for free from any beverage station. I’m not being tight I’m just being practical - I’d rather spend that money on a couple of cocktails to wind down with in the evening! Playing Cards - because what trip doesn’t as for them? There’s nothing like chilling out in the evening with a couple of drinks and some card games. it’s a great way to unwind and have a laugh with everyone. It’s also an instant bordem buster on the plane too! Chewing gum - nowhere on Disney property will you be able to buy chewy! Not at all, nothing even close to it. They flat out don’t sell it, in a bid to keep the park clean and clear. So if you want any, you need to bring it in yourself. Or bring mints (though you can buy those in the parks). I know I’ll be popping a few packets in! Waterproof/poncho - Even though I’m in the sunshine state there’s still the occasional shower that can catch you out in the afternoon and there're some amazing water rides that I just love to go on! I don’t mind getting drenched but sometimes it can take forever to dry off and the last thing I want is to feel all gross and uncomfortable in the parks! Ponchos are great for the hotter days when a quick storm catches you, or for throwing yourself down the log flume, and a really light waterproof is ideal when the weather takes a turn for much longer, especially in the evening when you still want to go out and have fun but not get drenched! These are great tips. It's been too long since I have been to a Disney theme park, I need to get myself to one asap.